Many variable flow hydronic systems utilize a bypass valve to balance pressure from the zones. Replacing these valves with an AC drive to control pumps can save energy. 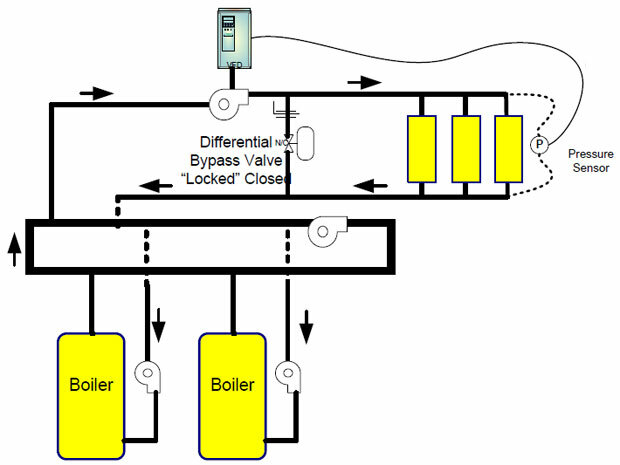 For example, in Figure 1, as zones become satisfied, the differential pressure control (P) modulates the bypass valve open to decrease flow to the zone loops. As pressure in the zone loop decreases, the bypass valve closes to ensure proper flow out to the zones. 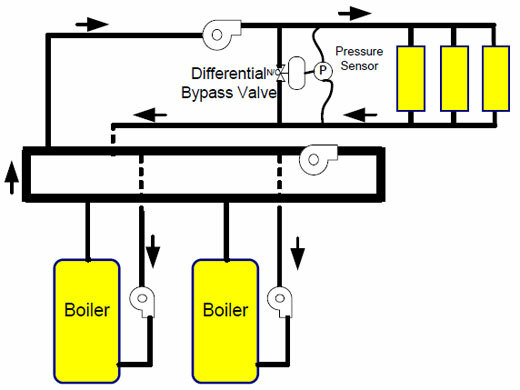 The bypass valve and electromechanical pressure control is replaced by an AC drive to control the pump and a new differential pressure sensor (see Figure 2). The pump speed (flow) is modulated to maintain system pressure. Placing the differential pressure sensor as shown ( farthest along the zone loop) can further increase control and possible savings. Decreased energy usage as pump speed varies with load. Electro-mechanical valve and pressure control is replaced with more accurate and reliable pressure sensor. Review boiler manufacturers specifications to determine low or no flow capabilities. AC drive minimum speed of the AC drive must be greater than boiler manufacturers flow specifications.